“Lemons” starts with a monologue from Dre about America’s love affair with upsets. This is true. This past Sunday at the Golden Globes, Tracee Ellis Ross enjoyed an upset as she became the first black woman to win best actress in a TV comedy since Debbie Allen in 1983. Anyone familiar with Ross’ career had to feel ecstatic watching her finally receive her dues. Ross’ work on Black-ish has been some of the best of her career, but her comedic skills as a sitcom actress have been obvious since she played the neurotic, perpetually single Joan Clayton on Girlfriends. 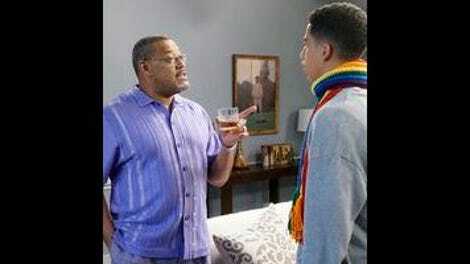 At a time when our president-elect is a man who once asked if Black-ish was “racism at the highest level,” Ross’ win didn’t just confirm the progress Black-ish has made to become one of the funniest, smartest sitcoms on the air; it also felt like a confirmation that diverse, complex TV can still prosper and be understood by mainstream audiences even in the face of ignorance. While Ross’ win was an enjoyable upset, “Lemons” focuses on a far more controversial win––Trump’s presidency. After this season’s earlier election episode that bid farewell to Obama, I wondered if we’d get an episode that takes on the realities of the 2016 election. “Lemons” does not disappoint and is the most comprehensive examination of the election that pop culture can provide. In one episode, Black-ish took on every sentiment, hot take, fear and hope that Trump’s election has inspired. Jack tries to be relentlessly optimistic while Bo’s pessimism roots itself in non-stop donations, volunteering and gay pride scarves. Zoey chooses to focus on the future while Junior gets “woke” and Pop drinks. These threads are all well-handled, but, in an episode that focuses on upsets, the true win in “Lemons” comes from an unexpected place––Anthony Anderson. Anderson is a solid player on Black-ish, but it’s hard to ignore how grating his character can be when Dre takes center stage. Take, for example, the episode “Nothing But Nepotism”––Dre’s reaction to Zoey’s first internship is far too exaggerated and over-the-top. Like most sitcom dads, he can be too childish at times and is rarely given moments to ground himself. While Dre’s office scenes are highlights in terms of hilarity, they usually handle heavy topics about as often as Dre’s coworkers actually get their work done. Most of Dre’s office scenes pit Dre and Charlie against their white counterparts, but “Lemons” brings them together as they all try to figure out how Trump could’ve possibly won. After the group clears “The Gays,” “Lateen-ohs” and “the blacks” they finally find an answer in Lucy, their resident white woman. Lucy is almost successful at selling the working class desperation that led to Trump, but the show doesn’t let her off the hook as the group answers her with the same arguments we’ve heard over and over again since November 8th. It’s during all of this back and forth that Dre starts to laugh. It was a laugh that was immediately familiar to me. I remember the moment during election night when I broke out into the exact same laugh. It’s laughter to keep from crying and it’s a coping mechanism referred to in black culture since the days of Zora Neale Hurston. It’s the sentiment black communities turn to when we can’t do anything else but laugh. It’s an odd mixture of hope, surrender and pessimism that inspires black people to turn lemons into lemonade or an unfortunate, upsetting Twitter-typo into a hilarious, trending hashtag. With all we have to deal with, sometimes all we can do is laugh. When Dre’s coworkers accuse him of not caring about our country, Anthony Anderson delivers a monologue I imagine nearly every black person in America wanted to shout on November 9th. Dre’s speech is honest, true and raw. “Black people wake up every day thinking our lives are gonna change, even though everything in the world says it’s not….No matter who won, we didn’t expect the hood to get better, but we still voted because that’s what you’re supposed to do.” As Pops would probably say, it doesn’t matter who the president is, “they” (and yes, I mean white people) would never be concerned about black people beyond buzzwords like “inner-city,” “black on black crime” and “guns,” but we keep working anyway. Anderson perfectly captures that frustration, passion and anger; elevating the speech beyond Dre’s usual lectures. This isn’t just a history lesson, it’s a beautiful defense of the legacy, burdens and dreams that African-Americans carry in this country. When Obama stated the below in his farewell address, he was only hinting at a part of what Black-ish is able to lay out completely in Dre’s speech. For African-Americans, Trump’s election win wasn’t shocking. We know Jim Crow and slavery didn’t go away, we’ve just seen them shift shape. How could we ever buy into the idea of a “post-racial” America when this country’s racism is constantly on clear display for us? Trump’s win is just another obstacle in a long series of obstacles that keeps us from realizing MLK’s full dream. We’re going to keep working, organizing and finding joy where we can along the way. In the end, that’s what this episode is about. It’s not about Trump or why the election happened the way that it did; it’s about identifying that feeling of hopelessness that has plagued so many since the election and finding a way to carry on. As Dre says, the morning after the election we all woke up and knew what it was like to be black in America––powerless, as though everything was unfair and out of our control. Mr. Stevens remarks that it felt awful, but, blackness isn’t just suffering, it’s also surviving and thriving. “Lemons” asks audiences to adopt both aspects of this duality in order to move forward as black people have done for centuries. Black-ish is in a unique position to identify this feeling because they’ve made sure their writers room makes space for those very voices that aren’t in power. 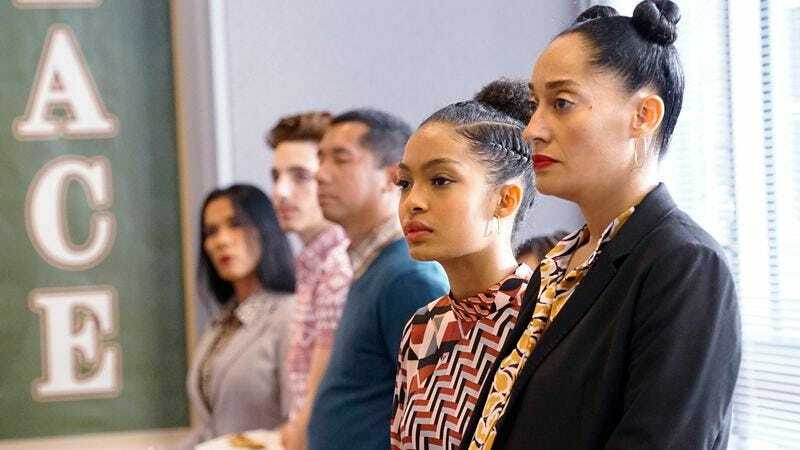 Black-ish isn’t “racism at the highest level,” it’s representation at the highest level and “Lemons” is a perfect example of what happens when that representation is allowed to thrive. Pop and Junior’s storyline does a great job of adding context to Dre’s office plot without feeling as though it’s shoehorned into the episode. Watching Junior slowly wake up to the history Dre presents while Pop warns him not to become another angry black man was a great parallel to Bow and Zoey’s “let’s be optimistic about the future” lesson. I’m ok with Diane sitting this episode out after that amazing, “I’ve always wanted to testify against one of my parents” line. Oh, Jack. It’s a bowl, honey. The “ship her back” scene in Junior’s school was based on real events. It’s really difficult to have faith in the future. Daphne writing “white women” on the board while Mr. Stevens pivoted from “Hey, wait a min…” to “ok, let’s hear her out” was great. “Well, white women aren’t sisters, we hate each other.” - This really did explain a lot. “Hillary Clinton is the Ben Carson of white women” is honestly the meanest thing I’ve ever heard anyone say about Clinton. It’s really rude that we didn’t get a shot of Ruby reacting to Trump’s win. I demand an extended cut that’s just 10 minutes of her yelling, crying and praying.